A Tags field may be used to add tags or categories to a post created with a Formidable form. Please note, your form must be set up to create posts in order for the Tags field to work properly. Display the value submitted in a Tag field in a form's confirmation message, email, or View. Just insert [x], where x is the ID or key of the Tag field. If you would like to allow users to add tags to a post created with a Formidable form, follow the steps below. Set up your form to create posts. 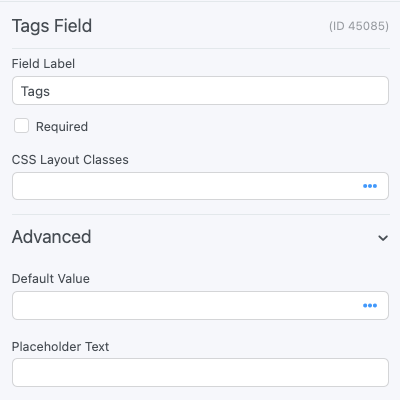 Add a Tags field to your form. Go into your form's 'Settings' → 'Form Actions' and open your 'Create Post' action. Under 'Taxonomies/Categories', add a row for 'Post Tag' and map it to your Tags field. Users may enter any new or existing tags in this field and they will be attached to the post automatically. When entering multiple tags, they must be in a comma-separated list. If you would like to set a default category or add existing hierarchical categories to a post, please see this article. If you would like to allow users to create new categories that will be attached to their post, follow the steps below. Go into your form 'Settings' → 'Form Actions' and open your 'Create Post' action. Under 'Taxonomies/Categories', click 'Add'. If you want to create standard WordPress categories, select 'Category' and map it to your Tags field. If you would like to add items to a custom taxonomy/category, select that taxonomy from the dropdown on the left. Now, when users fill out the form to create a post, they can add a custom category for the post. If the category already exists, a new category will not be created. If you have hierarchical categories, the newly created category will always be on the highest level. When entering multiple categories, they must be in a comma-separated list.